When life hands you lemons, there's a lot more you can do than just make lemonade! So if lemons leave a sour taste in your mouth, you might want to know about ten surprising new, non-food uses for the handy little citrus fruit. -- During the winter months your hands can become dry and nails can become brittle. To make them look younger the natural way, remove polish/give your nails a good scrub, then soak in pure lemon juice for 1-2 minutes. -- Wash hands again with soap and water, and pat dry. Apply hand lotion to revitalize your winter hands and show off your bright nails. -- Add ½ cup strained lemon juice to the wash cycle of a normal-size load. As your whites soak in the warm water, the lemon juice will gently bleach the items in the load without harming the fabric. -- Be sure to have a few lemons on-hand while entertaining at home. After guests finish their appetizers, encourage them to stick their used toothpicks into the lemon - that way, your tables, floors, and sofas will stay dirty toothpick-free. Reduces the mess for you to clean up in the long run. -- If your stock of brown sugar in the pantry is a little dried out, place a 3-inch long lemon peel into the bag and let it sit over night. -- The liquid in the peel will seep out and keep the sugar moist and flexible so that it does not harden into a solid mass. -- As soon as the temperatures climb, there is no better treat than ice cream or sorbet served in frozen citrus peels. After using lemon halves, scoop out the pulp and freeze the peels. -- Cut a small slice off the bottom of the lemon, so as the 'bowl' won't roll around on the plate. -- Fill the peel with your favorite frozen treat for a quick snack that is easy to make but looks fantastic at a party. -- Cut a lemon in half, and rub the pulpy side of the fruit along both sides of the cheese grater in order to keep the grates clear of residue and sharp for years. -- Plus, the acidity of the lemon will ward off rusting and scent is sure to beat the stench of harsh household cleaners. 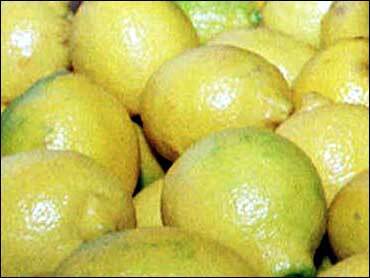 For more form Real Simple on non-food uses for lemons, click here.